They’re back! 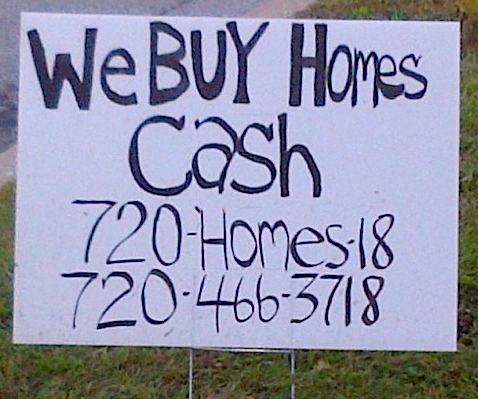 Once again these’ homes for cash’ signs have popped up in Mt Kisco? Would you really trust the sale of your property to someone who can’t even splurge for a couple of professionally printed signs? In fact it looks like they left out the word ‘For’ in the sign , or maybe they just didn’t have enough ‘Cash’ for a bigger sign – who knows? I would love to hear from anyone who has used these guys. Selling your home is one of the biggest investments you will make and should be left to a professionals ( like myself ) who has the knowledge needed to get the job done right (and licensed). According to a study done by HomeGain in August 2012, Home sellers are more than twice as likely to get their home sold if they use a Realtor and for more money than if they try to sell it themselves. If you are thinking about buying or selling your home I urge you to call a professional . Check out my website at www.FindAHouseNow.net I happen to work for a great agency, why not check us out www.JudyJohnsonRealEstate.com ‘A Complete Moving Experience’ . The market has definitely changed in Westchester and it is a great time to sell. If you are looking to buy interest rates are still at record low rates. Don’t hesitate any longer make the move, just be sure to use a professional. The professional realtor is your best option when it comes to marketing your greatest asset. Kathy Feeney is the Mount Kisco expert and anyone posting a sign like that is suspect…There are plenty of investor/buyers that have cash that will purchase a home. Leave it to the professionals. Thanks for the info!